The 2018 Volkswagen Tiguan Limited is available for shoppers around the Providence RI area. At Speedcraft Volkswagen, we want to tell you all about our available Volkswagen models. We will show you the ins and outs of this SUV. Let’s take a look and see what you think about this model. The 2018 Volkswagen Tiguan Limited is a subcompact SUV that comes standard with a 2.0-liter engine that delivers 200 horsepower and 207 pound-feet of torque. This vehicle can also seat up to five passengers. The Tiguan Limited also has some great safety features like Electronic Stability Control (ESC) and Anti-Slip Regulation (ASR). Now that you know more about the 2018 Volkswagen Tiguan Limited, let’s take a look at some of its key features. The 2018 Volkswagen Tiguan Limited is designed to give you the best of both worlds. It gives drivers the power and they space they want. There are other fun features inside this model that will help you enjoy your driving experience. Check out this vehicle’s key features to learn more. The 2018 Volkswagen Tiguan Limited has even more in store. 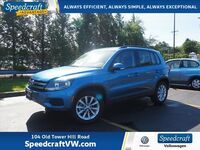 You can learn more about the 2018 Volkswagen Tiguan Limited by checking out our online inventory and schedule a test drive with us at Speedcraft Volkswagen today.